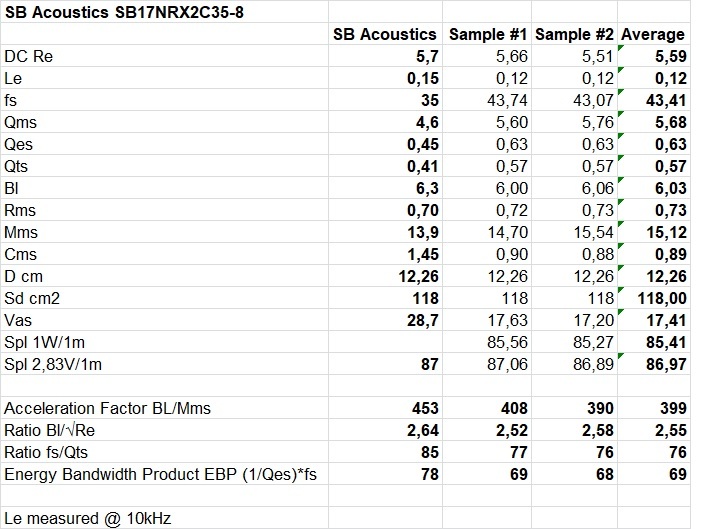 The SB Acoustics SB17NRX2C35-8 is a 8Ω 6″ mid-woofer from SB Acoustics. 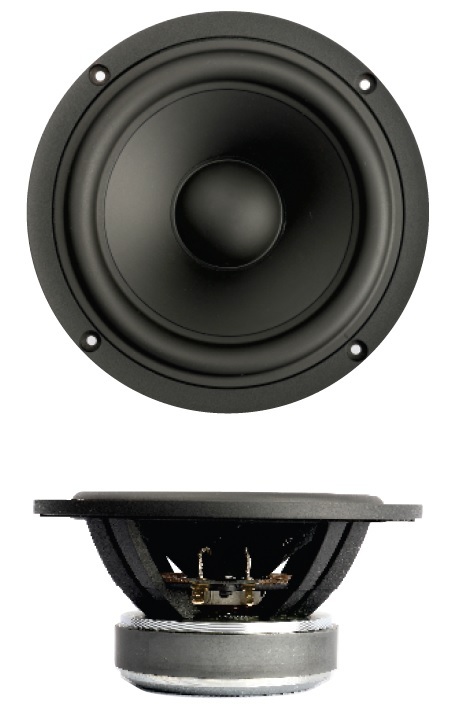 The mid-woofer has a 35.5mm voice-coil with a healthy 11mm (p-p) linear coil travel. It has a very low voice-coil inductance and is fitted with a copper sleeve on the pole piece to ensure a low distortion performance. Left: T/S parameters measured using “added” mass method in horizontal position. Right: T/S parameters measured using “known” mass method in vertical position. The drivers where burnt-in for 3 hours at 8.5 Volts using a 35Hz tone and then cooled off before measuring. Left: Free-air impedance driver sample #1 vs. sample #2. 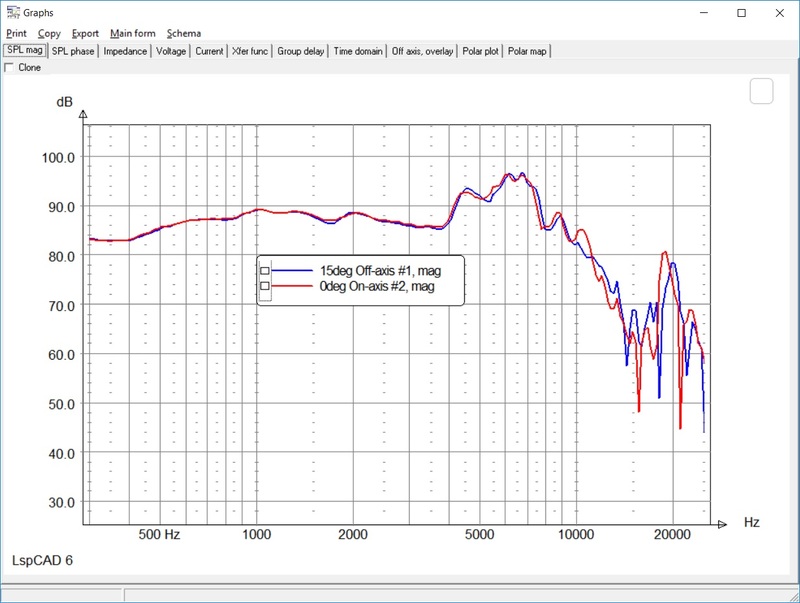 Right: Close-up of free-air impedance driver sample #1 vs. sample #2. Some wrinkles in the impedance plot are visible at 1.7kHz and 6.5kHz. The wrinkle at 6.5 is the cone break-up frequency. Baffle size (WxH): 20×40cm. No baffle edge round-over. Driver position: Mounted on center-line with driver unit center 17cm from the bottom of the baffle. Mic position: 1m distance, on mid-woofer-axis. Smoothing: No smoothing applied. 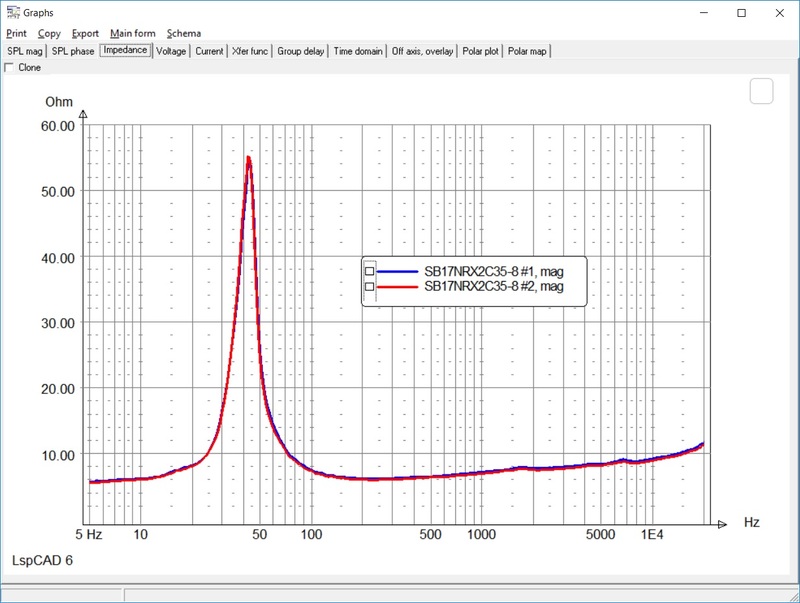 Measurement valid down to 275Hz. 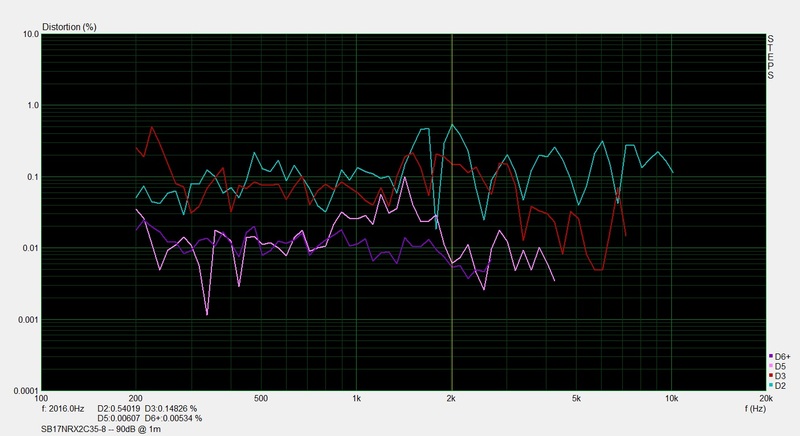 Left: Frequency response on-axis (Blue=sample #1, Red=sample #2). 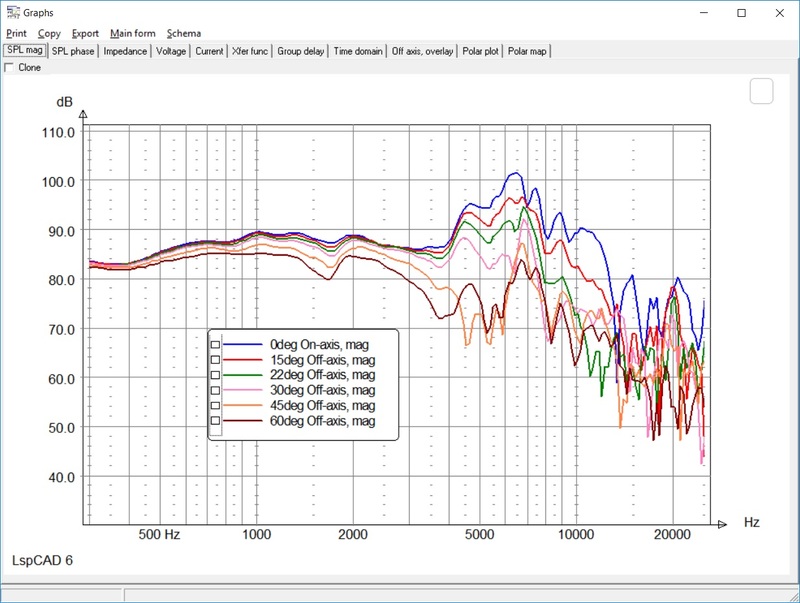 Right: Frequency response 15deg off-axis (Blue=sample #1, Red=sample #2). Smooth frequency response up to 4kHz. 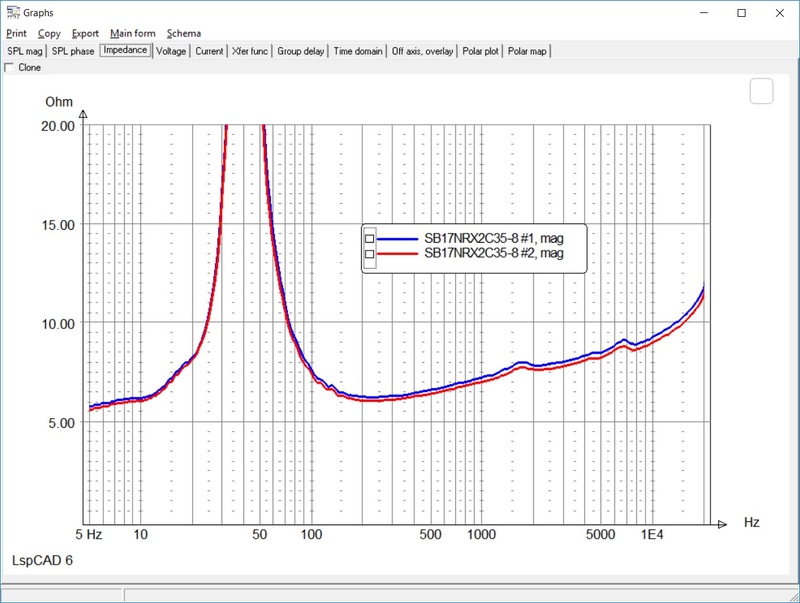 The cone break-up at 6.5kHz might need some attention, depending on the choosen cross-over topology. 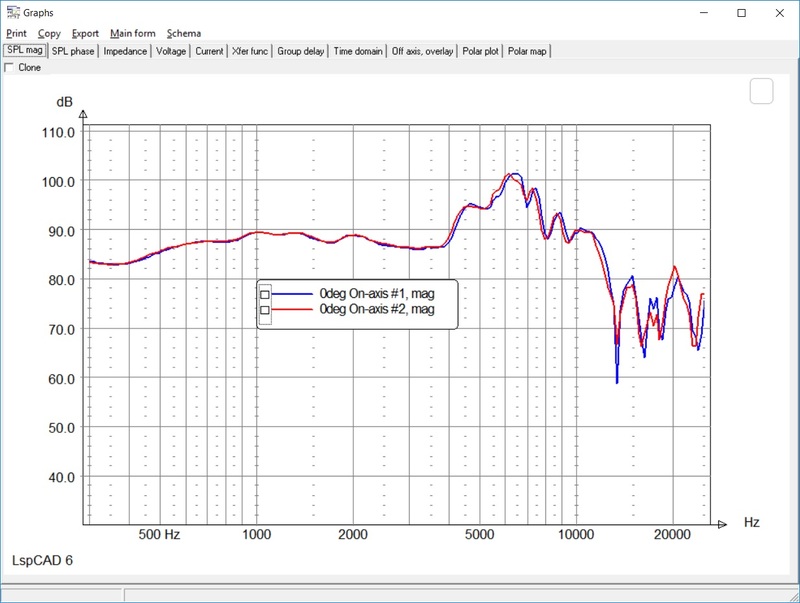 2.5kHz is about the highest suitable cross-over frequency for this mid-woofer. The distortion measurements are done in near-field and the amplifier output level was adjusted for each driver so that the fundamental is 90dB and 95dB at 1m. This setting simulates medium-high to high listening levels. Overall this is a very low distorting mid-woofer. We have some relatively harmless elevated second-order harmonics around 2KHz. The 6.5kHz cone break-up show up as a small elevated 3-order distortion around 2kHz. 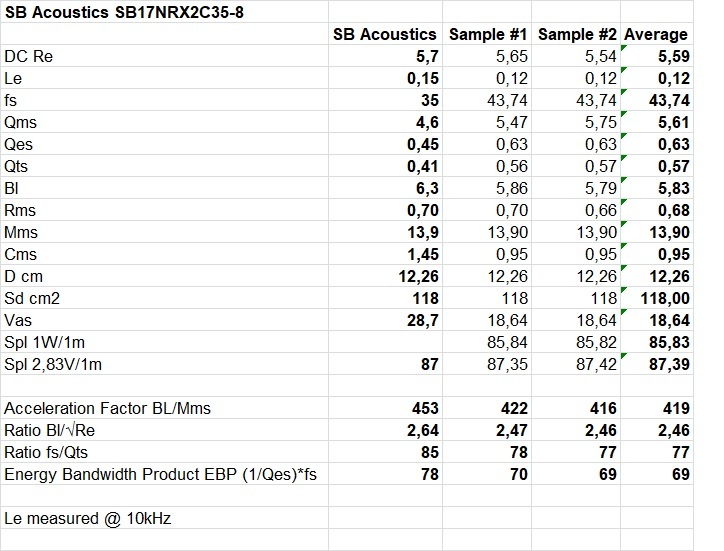 The rise in distortion at 2kHz and 95dB @ 1m is only 0.21% and is negligible.